In 1967, Kloeze described that prostaglandins influence the aggregation of blood platelets very effectively. Prostaglandin E1 (PGE1) is a strong inhibitor and PGE2 a week stimulator of platelet aggregation . It was also shown that PGE1 is able to inhibit arterial thrombus formation (Fig. 4.3). 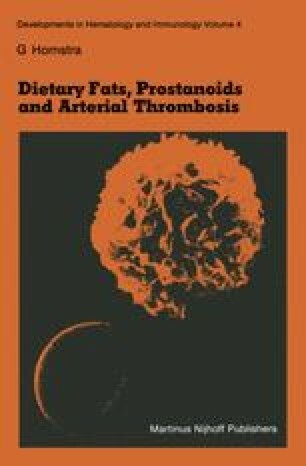 Since linoleic and α-linolenic acid are the ultimate dietary precursors of the prostanoids (Chapter 2), the effect of these essential fatty acids on arterial thrombogenesis might be mediated by prostaglandins and/or related compounds. In order to investigate the possible role of these compounds in arterial thrombus formation, we decided to investigate the effect of essential fatty acid deficiency  which is associated with a low PG production in tissues [197, 800].